I've done this before... sickle cell is so painful, i put my leg back and kept roller blading like it was nothing. Basically, i was roller blading, some kids were sitting in the middle of the floor, and i ran into them accidentally. From my left knee down was twisted a full 180°. It went backwards like an emu's (or is it an ostrich? )'s legs, and i stood on it and pushed with my right leg in the correct direction to put my leg back straight. Obviously, balance is key, or i could have really fucked up my leg. But, i also have insane balancing skills, like ive never fallen down except one time as a kid at age 5, down a flight of cement stairs. (There were 26 steps to an apartment complex in El Cajon.) I had a sandwich in one hand and a soda in the other, and spilled none despite going head over heals. I then got up and ate the sandwich and drank the soda, also as though nothing had happened. When i did the skating thing, everyone looked horrified. That was in my mid to late 20's. I am 30 now, as of February 12th. You could even hear the thing rotate and popping back into place because of the wooden floor. I have that high of a pain tolerance. Im actually in the hospital now from a sickle cell crisis. Another event, when i was in my teens, i jumped from a swing and landed on my feet, but my left leg knee went into my chest, and cracked a bone. You could hear it. And i still have the knot in my chest where it healed to this day. I stopped breathing from it, but i walked it off. I went to the hospital none of those times. Sickle cell is that painful. And it only gets worse the older you get. Your blood cells are constantly tearing at you from within, because they are all scythe shaped. That shape, also means they can clot and hook together into spiked blood balls of death, clotting in you wherever they happen to choose. 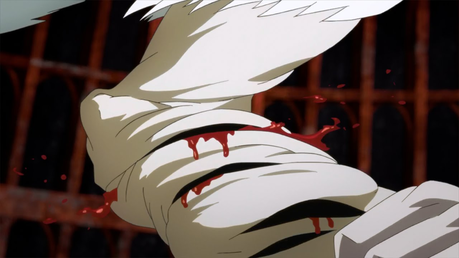 When i saw Kaneki go through his leg thing, i felt like i could finally relate to someone because of it. Like now, when folk ask what the pain is like, i just show them this gif. It's so bad, many women have straight up said "I'd rather go through a pregnancy a day for the rest of my life, than have to deal with sickle cell as bad as you have. ", to other women friends and myself. I even knew someone who got shot, who also has sickle cell. They said they'd rather get shot up and have to live through it, again and again, than deal with sickle cell.